The present church dates back to the 13th century, but it replaced an earlier building, traces of which were found during excavations in 1998. Also older than the church are two 12th century stone coffins dug up in 1862, now set each side of the entrance porch. 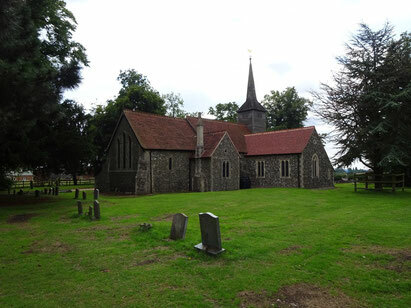 One of them is said to be the earliest, finest and most complete example in Essex. 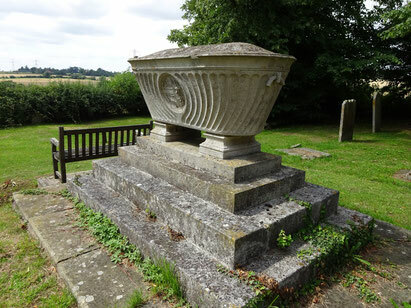 Elsewhere in the churchyard is a 17th century brick chest tomb for a former Rector and a large raised casket monument designed in 1797 by the architect Joseph Bonomi for the Smith (later Cunliffe-Smith) family of Suttons Manor in Stapleford Tawney. The church walls are made from ordinary stones from the surrounding fields and reused material – some Roman – from the previous church. Limestone blocks were brought in for the corners and window surrounds. The chancel (east end) was built first, in about 1220, followed by the nave and then the side chapel. 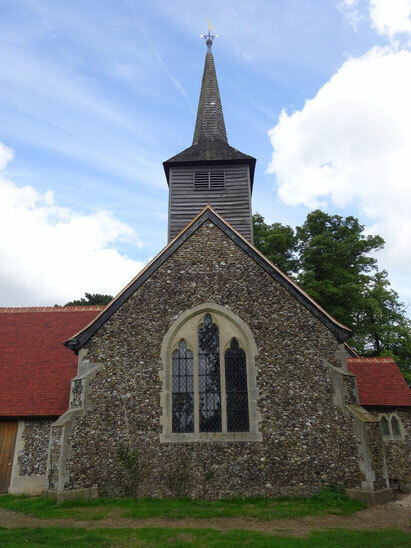 The timber tower and porch were added in about 1500, and in 1862 the vestry was built and the whole church thoroughly restored. The Parish Room was added in 1999. Some of the details are described below, starting at the east end. The altar rails with their unusual pierced balusters date from the 17th century. They originally surrounded the altar on three sides but were straightened out later. The 13th century narrow lancet window in the north wall has distinctive green and purple Victorian stained glass. There used to be more of this, but most of it was destroyed in 1940 when a flying bomb landed nearby. 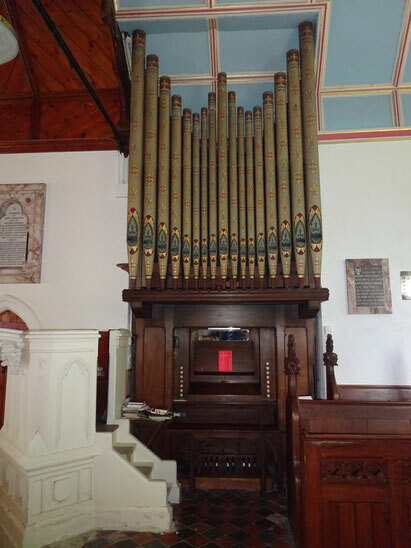 The organ was made by the famous ‘Father Willis’, who actually played it at its dedication service in 1873. The side chapel – a miniature version of the main church with an altar table at the east end – was originally screened off and was dedicated to St Agnes. Later it was opened up and the pillar inserted. The wooden cross on the altar table was carved out of a 13th century oak beam taken out of Westminster Abbey during building works. The pulpit, choir stalls and pews all date from 1862. 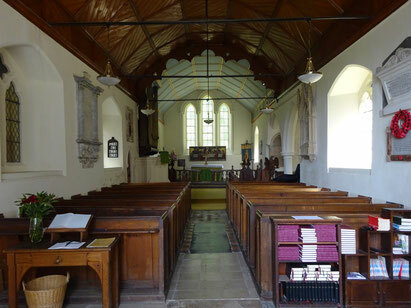 The two back pews by the door, however, are older – and more uncomfortable! 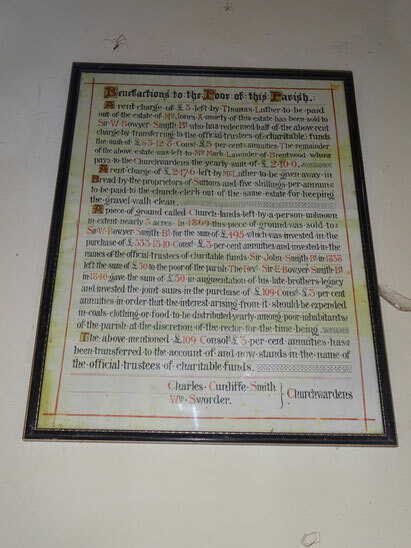 Around the nave walls are various memorials to the Smith family, including Drummond, who was “cut off by a fever at Palermo” and Charles, who was “pious without enthusiasm” (in those days ‘enthusiasm’ meant ‘fanaticism’). But the oldest and perhaps the finest wall tablet is to Grace Addison, a mere servant to the Luthers, the family who lived at Suttons before the Smiths. The timber tower with its massive oak posts was built within the older flint walls in about 1500 and houses two 17th century bells. Traces of the original red ochre paint can be seen on its timbers, as can the evidence of a major fire in 1968 which destroyed the upper part of the spire. The font is a 19th century copy of a Norman column with an older cover. The north doorway leads through to the Parish Room, under the original 13th century arch. This newest addition to the church was designed by parishioner and architect Tony Mitchell to match the existing building as closely as possible but with a light modern interior. It is used for the choir, Sunday School, meetings and social events, and earned a Diocesan Design Award.